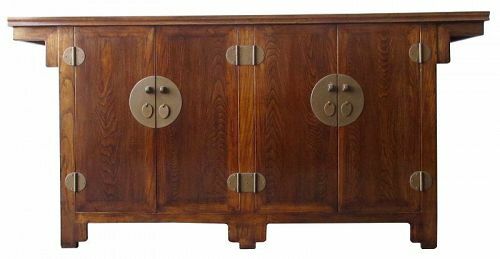 Antique Chinese hardwood buffet cabinet, with two sets of front swinging doors, each with round lock plates and hinges. The interior of each side holds a single middle shelf, with two small drawers below. A large Chinese gongshi, or scholar rock, highly appreciated as a contemplative viewing piece by literati. 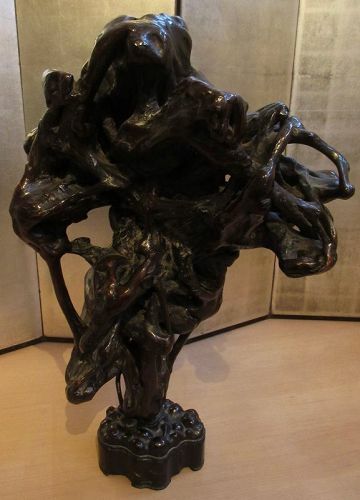 The piece is formed by natural elmwood root that has been lacquered, entangling a lingbi stone, originating from the Anhui province of China. Inset within a wooden base. Dimensions: 16 3/4" high (10 3/4" high without stand) x 12" long x 5 1/2" wide. 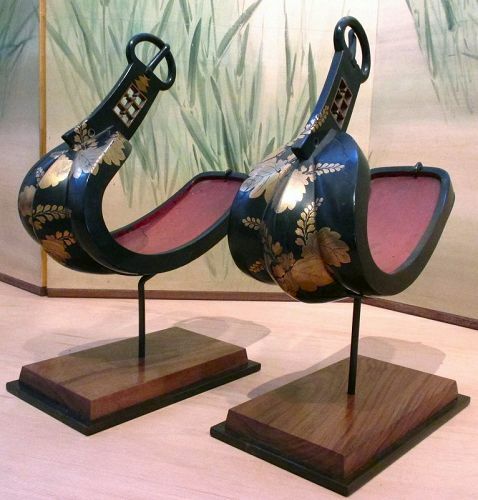 Antique Japanese ikebana basket, for display of flower arrangements. The piece is all hand-woven with bamboo with a wide rounded mouth, and squared base. The handle is made with braided thin sections of bamboo, secured at the sides with knots. 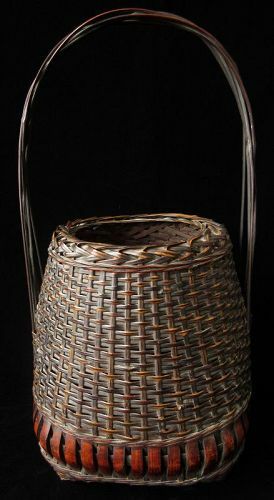 The basket interior holds a striped bamboo vase. Antique Japanese Kanban soroban (abacus). 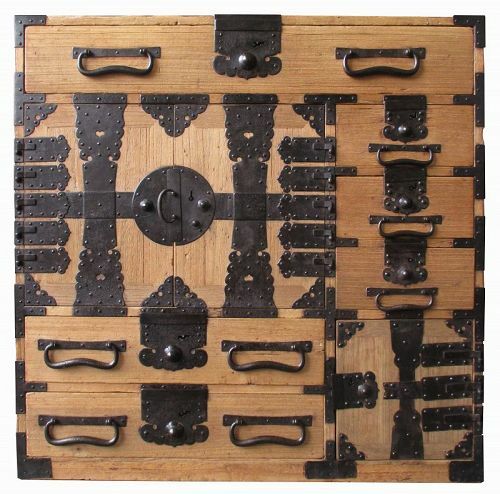 Used by merchants, this large sized abacus has eyelets for hanging. It has 21 rows of wooden beads with 5 beads in each column (105 beads total). The beads are fitted onto wooden dowels. Behind each dowel is a boar's hair bristle which holds each bead in position when it's pushed upward even while the soroban is hanging sideways. Dimensions: 43" wide x 12" high x 2 1/4 deep. 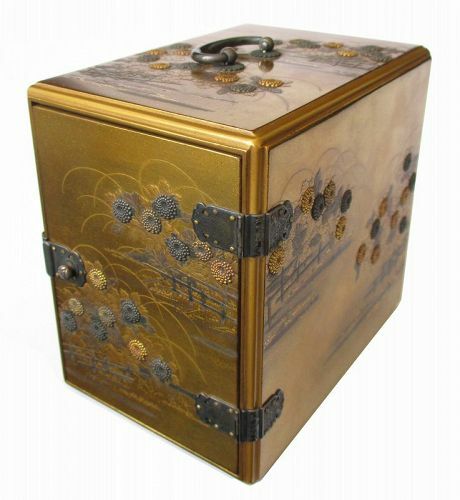 Antique Japanese ko tansu (small chest of drawers). The piece is made with Sugi (cypress) hardwood top and sides, while the front is made with Kuri (chestnut) wood, with the original red lacquer finish and black lacquer frame. 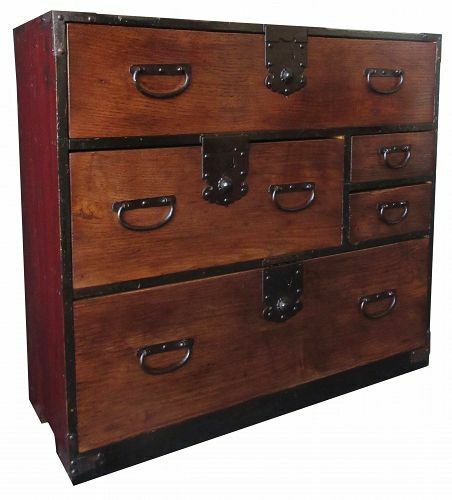 The piece holds five drawers of various sizes with heavy iron lingzhi form lock plates, and warabite style handles. 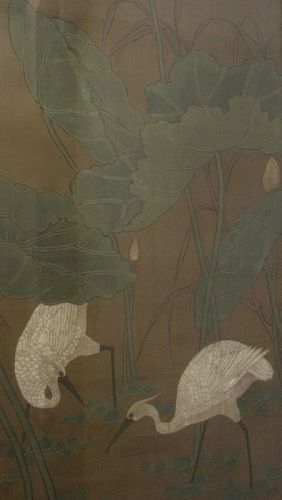 Large framed Chinese painting on silk ground, of two white herons crouching beneath lotuses and reeds, as a small hummingbird flies into frame from the top lefthand side. 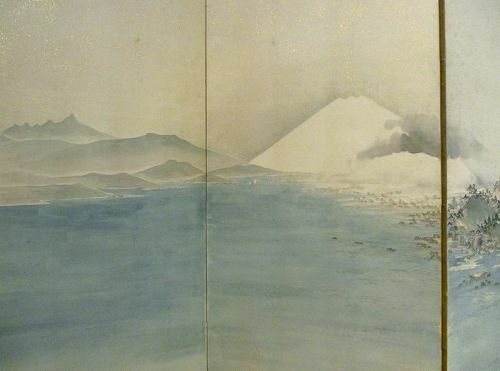 The painting is displayed within a bamboo style gilt hardwood edge frame.